Jesus offers his invitation—indeed his command to “Come” in the context of a fallen world that makes people children of hell and misery. His immediate audience lived under the religious scrutiny of the Pharisees and Scribes who will later receive from Jesus a series of “Woes.” Jesus will rebuke these religious leaders for the burden and condemnation they lay on others. So many of us live under these burdens that we accept from others, the world, the culture and that we place on ourselves. These are burdens that we are not able to bear, and in this world we find no help. We carry the burdens, fears and worries of expectations we cannot meet, standards we can never exceed, criteria that condemn, ideal lives that are unlivable and our doubts and despair. Whether it is in our schools, jobs, families, or the mirror or in our minds, we take on unbearable and ungodly burdens. These burdens make us children of are—children of misery who live according to vain pursuits and deluded imaginations or under constant despair and lopsided comparisons. This is what the world, Satan and any authority outside of Christ brings. I’ve experienced this problem as a pastor. Like most pastors that I meet, I want to excel in serving God in my ministry, so I read and listen to experienced pastors and leadership experts offer guidance on leadership. I recently read a book by church leadership speaker and author Dave Kraft called Mistakes Leaders Make. In this book, he offered some good counsel; however, his book illustrates the worst mistake leaders make: tying up heavy burdens on people’s shoulders that are impossible to carry. On one hand, Kraft writes, “”A leader’s primary responsibility is to hear from God.” (page 65) Then, on the other hand he writes, “The primary responsibility of a leader is to develop additional leaders.” (page 89) This is a blatant error and creates a double-bind for readers who are probably already stressed with trying to be the best they can be. Now the author has given us two “primary responsibilities.” Heaven help us. All of us are barraged with this type of “advice” of what we must be and do. I can’t tell you how many women’s magazines I have noticed that share two emphases on the cover: losing weight and cooking great desserts or meals (not the kind conducive to losing weight either). This is the world’s pattern. How refreshing to hear from Jesus his invitation to “Come.” Jesus promises us rest for our souls. He doesn’t set us down on a lounge chair and give us a cold drink either. He offers us himself as our Sabbath rest. We enter into him, and we are accepted and fulfilled in our Creator and Savior. This is why this verse is such a comfort and encouragement to Christians. Surely, this is one of the most well-known Scriptures, and for good reason. Jesus promises rest, and he commands us to learn from him. He calls us to become his disciples. He commands us to take his yoke and his burden. We don’t come and sit; we come and follow; we walk in his steps. What his Jesus’ yoke? What is this burden? Is it more of the same? Is it unbearable and oppressing? I think the simplest answer is to say that Jesus’ yoke is his grace. Grace. We are called to accept and to take his grace—his free gift of love, strength, wisdom, goodness, discernment and power. We are commanded to carry his burden. I think this is the burden of our calling and vocation—the good works that He has prepared for us to walk in by his strength and power that work in us according to his good will and purpose for us. I think the Apostle Paul gets at this interaction with the Lord when he writes, “He said to me, ’My grace is sufficient for you, for my power is made perfect in weakness.’ Therefore I will boast all the more gladly of my weaknesses, so that the power of Christ may rest upon me.” (2 Corinthians 12:9) We come to the Lord in our weakness to carry burdens and our weariness in the world. He gives us the yoke of his grace and strength to carry out our calling in the world by his power to his glory. His yoke gives us the gift to hear his voice and to know his will, so that we can walk in the way he makes for us. He gives us the power and discernment to say “no” to what is not for us and to say “yes” to what is for us. He gives us the grace that takes away accusations and condemnation for being what we are and for not being what we are not. When I was reflecting on the yoke of Jesus this week, an image came to mind. 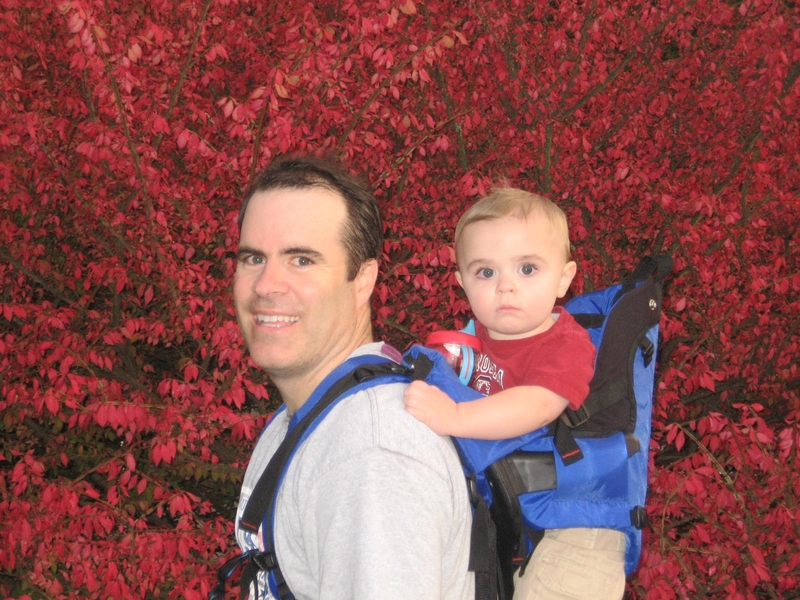 When my son Jack was 1-2 years old, I had a backpack carrier for him. We lived in Western PA near a large park full of hills and hiking paths. I could never comfortably carry Jack more than a 100 yards or so in my arms or even on my back at the time. However, with the backpack I would set him in it and strap him in and then lift the backpack and strap it onto my back with him in it. It was comfortable for both of us. With it, I could carry him for hours up and down the hills or wherever until he eventually outgrew it. I really enjoyed the bonding we shared with the backpack. I think that Jesus’ yoke is like the backpack. It is actually a resource of strength and comfort that helps us carry the gifts he has given us and fulfill the work to which he has called us. In this case, I imagine that Jack was the burden Jesus gave me and the backpack was the yoke I took upon me to help with the burden. Both were blessings and not curses; both were gifts of grace. For the roles in our lives in our families, vocations, churches and communities, God gives us the gifts of grace and spiritual power to fulfill our duties and his calling for our good and the common good of those in the family of faith and among those that God is calling to himself. 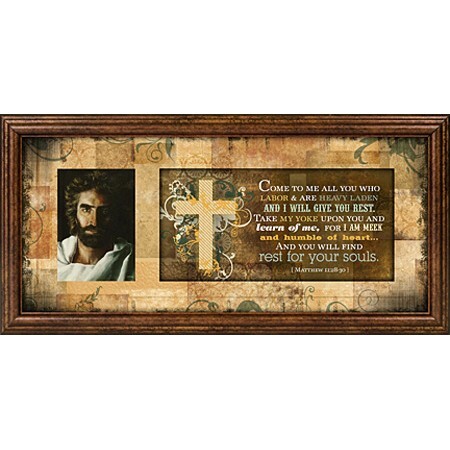 John the Baptizer said that “A person cannot receive even one thing unless it is given him from heaven.” John 3:27 As we learn of Jesus, we learn to accept what is given from heaven and to deny ourselves what is from the world, even what seems good. Learning of Jesus, taking his yoke and his burden contribute to our taking up our cross and following him and to denying ourselves, as we gain life in him. Our rest in our Sabbath includes active participation with the Lord of the Sabbath.